A hundred miles off the Chelish coast lies the remote island of Deepmar, where the House of Thrune sends prisoners to work in crystal mines, wrestling valuable spell components from the depths of the earth. A month ago, all contact with the penal colony ceased, and now someone must discover what mysterious fate has befallen the prisoners and guards of this isolated mining operation. The abandoned colony shows no signs of struggle yet something is clearly not right: Herds of animals lie mutilated in the surrounding fields. The savage beasts of the island have run amok inside the compound. And the silent, gaping mines - each named for a different layer of Hell - lead to new threats beyond anyone's imagining. As the PCs explore the island in search of the missing miners and their jailers, what they discover may unhinge their very minds. If left unchecked, the new masters of Deepmar could bring about a new era of madness for all of Cheliax - and beyond. 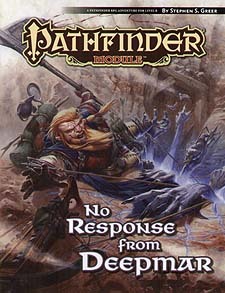 No Response from Deepmar is an adventure of horrifying dungeon-and-wilderness exploration for 8th-level characters, written for the Pathfinder Roleplaying Game and compatible with the 3.5 edition of the world's oldest RPG. This volume also contains a gazetteer of the island of Deepmar, a detailed description of the abandoned penal colony, and a brand-new monster, all of which can be easily adapted for use in any campaign setting.